Collins Booksellers - “Greatest Motivational and Inspirational Quotes on Life, Love and Happiness" by J.D. Rockefeller, 9781311108180. Buy this book online. 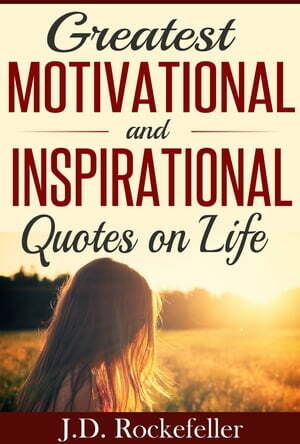 This book contains over 1200 quotes that will not only serve as a wonderful source of motivation in your daily life, but it will also serve as a go-to reference source of uplifting and positive ideas, words, and phrases that you can share with your loved ones, as needed, to lift up their spirits, offer a word of encouragement and wisdom, let them know how much you love them, or simply bring a smile to their face. “Greatest Motivational and Inspirational Quotes on Life, Love and Happiness” will also become your # 1 companion during your travels, white waiting for an appointment, or making time for a friend to show up to a concert or a local café. It is the perfect book to take with you on a vacation, when you finally have time to relax and recharge. And it also makes a great gift for your friends and family, as anyone can find many of these quotes that he/she can personally relate to! Did I mention, these proverbs and sayings are also great to write on postcards and letters! And because laughter is at times the best medicine and one can never have enough joy and laughs in one’s life, I have included a Bonus Chapter of Funny Quotes that will have you laughing out loud! This amazing collection of inspirational quotes has an easy to use Table of Contents, which divides the quotes into different topics: Motivational Quotes, Love Quotes, Inspirational Quotes, Thank you Quotes, Friendship Quotes, Birthday Quotes, Happiness Quotes, Quotes about Strength, Broken Heart Quotes, etc., making it extremely easy to look for exactly the quote you need when you need it. That way you can either choose one quote to read during a particular moment, choose one whole section of quotes to read on one particular subject such as Love, or just read as many quotes as you want at once.